Dubbed a “brain health miracle” by its maker, Curcumin2K is a product that is said to offer multiple benefits including improved memory, a sharper mind, mood boost and increased energy levels. Furthermore, it promotes detoxification and healthy inflammatory response while also supporting muscle and joint health. The efficacy of the formulation is tied to turmeric root extract said to promote overall wellness. 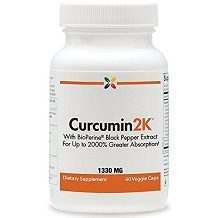 Our Curcumin2K review should help you decide if this is a product worth buying. 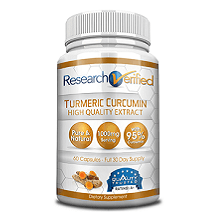 Turmeric root extract is the main active ingredient in this supplement. The herb has been used for thousands of years in India and other parts of Asia in promoting health. Its secret lies in the compound known as curcumin. This has been shown in research to improve inflammatory response and support efficient brain function. The powerful antioxidant improves cardiovascular health, joint health, performance and recovery from exercise. The extract is supposedly standardized to 95% curcuminoids, including Curcumin, Demethoxycurcumin, and Bisdemethoxycurcumin. The absorption of curcumin and other nutrients in Curcumin2K is enhanced by Bioperine, a black pepper extract. The manufacturer recommends two capsules of Curcumin2K per day, ideally with meals. They do not specify if the capsules should be taken together or at different meals. Although we didn’t come across any mention of side effects, it still has to be said that caution should be exercised. Upset stomach, nausea and digestive problems are among possible side effects judging by some of the ingredients. The supplement should ideally not be taken on an empty stomach. It is not recommended for pregnant or breastfeeding women or individuals with existing medical conditions without seeking a doctor’s guidance. The cost of Curcumin2K on the manufacturer’s website is $28.50 for a one-month supply of 60 tablets. Discounts are available on orders of three or more bottles. The price per bottle works out to just $19.95 when you buy six containers. The company promises free shipping. Going by the money-back guarantee on offer, it appears the manufacturer is very sure of this product. It offers to refund your money if you do not get desired results in a year. From a number of factors we have considered above, Curcumin2K does look like a product that can help improve your memory and overall health. It is said to be produced in the United States in an FDA-approved xfacility and the money-back guarantee is impressive. It has also garnered a good feedback rating ratio on Amazon with 81% positive and only 10% negative scores. Are one concern here is the unpleasant reaction some customers have reported.